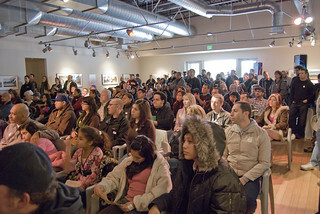 A rapt audience (standing room only) in attendance to hear David Gonzales speak about his work and his community. Among many other topics, Gonzales answered questions about how he would counsel latino youths. His seemingly unsentimental yet obviously heartfelt answer brought some to tears. "Look in the mirror and learn to like what you see," he said. Gonzales knows a bit about mirrors, and his community.